Day 10. That's our fun day. We had "Ice Liberty," Science Team Cook Day, bingo, and movie night in the hangar. Pictures and videos from this day will be forthcoming; however, since our Internet connection to the outside world has kinda went kaput, there's nothing to show at the moment (until we get in range of our satellite again). Today was a no-science day, thanks to our principal investigators, Lloyd Keigwin and Neal Driscoll. We've been working really well on the science the past nine days, so we finally had a chance to catch on sleep, relax and recreate. Thanks co-PIs! Ice liberty, ahhhh. 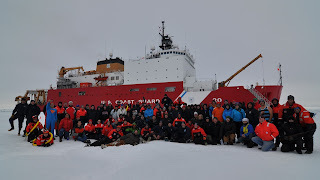 As you can imagine, we stopped our gigantic ship next to a humungous piece of ice real estate, and we ran around like little children, and played. Responsibly, of course. The ship's leadership, CAPT John Reeves and CDR Greg Stanclik, did a stupendous job preparing all-hands for the this once-in-a-lifetime opportunity. The way in which ice liberty was executed was flawless. Wait for the pictures of all the smiley faces, and you will see. For dinner, the science team did all the cooking, and the cleaning. The science team gave the amazing food service staff a day off, and fed the whole ship five different types of pizza, wings, and fried cheese sticks, plus healthy salad-type items, too. After dinner we played bingo, and it looked like a packed mess deck for this event. ENS Rebecca Follmer served as the M.C. and organizer; she did a smash-up job organizing bingo night, and movie night in the helicopter hangar (The Hangover III). A great day all-around. Days like these makes the commitment to science, and the time away from family and friends more agreeable. Oh, great job Arsenal Football Club! 3-1 victory over Fulham Football Club in the English Premier League. First league victory of the year. Go Gunners!!! !